When I was growing up, my mother was confined to a wheelchair due to Muscular Dystrophy. Although she was hardly quadriplegic, hers was nevertheless a difficult life, and there were many things she couldn't do without help from another party. By the end of her life, she was too weak to even lift her arms. Her story is hardly an uncommon one. All throughout the Western World, we've individuals who - for one reason or another - are confined almost entirely to their chairs. Had they only the use of their arms, they might at least be able to use modern technology, but many of them don't even have that luxury. Not surprisingly, there's a fairly large camp that seeks to address this problem - and to better enable quadriplegics. We've already seen some of the fruits of their labor - mind controlled computers and the like - but one team of researchers headed by Katia Vega is determined to show that our technological solutions need not be complicated or expensive. Together, they've developed a remote control that allows a patient to operate a television simply by blinking. The project is called Winkymote, and consists of a tiny remote control hidden behind a special type of makeup known as "Empowder." 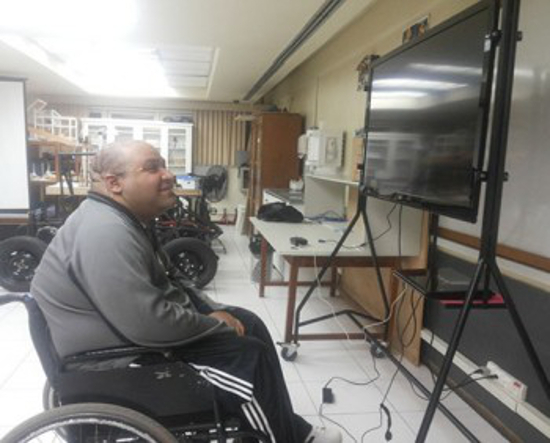 Created in collaboration with Clio (an Arduino-based microcontroller and part of Seeed Studio), the project was initially developed by quadriplegic ex-jujitsu fighter named Felipe. Thanks to the remote control, he can now turn his television on and off by blinking his eyes. Empowder is part of a larger set of projects by Vega and her team, known as Beauty Technology. Basically, it's cosmetics that can be used to interact with electronics - so far, they've developed everything from conductive makeup to nails that allow a wearer to interact with their gadgets through RFID tags. Cool, right? You can read more about Winkymote and Beauty Technology's other products here.